A Remembrance Day ceremony starts at the cenotaph outside the Gravenhurst Opera House, where a wreath-laying ceremony takes place, followed by a march to Royal Canadian Legion Branch 302 for a service at 11 a.m.
Lots of parking at Legion and across the road at the Port Carling Community Centre. This is an annual free event hosted by the Port Carling Legion Branch 529. Across from 115 Manitoba St. 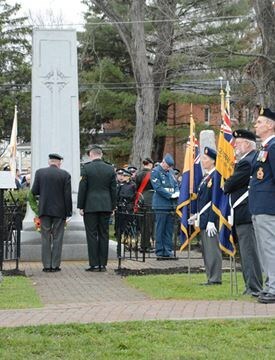 The parade starts at the Bracebridge Memorial Arena and finishes at the Cenotaph in Memorial Park.